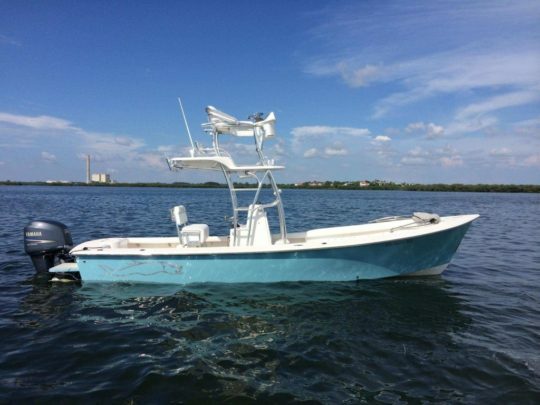 This beautiful 2010 Gause Built 26 is now available for purchase. This boat has a full tower with Custom GB hardtop and folding option Garmin 5212 touch screen in lower station, Garmin 4208 in upper station, Garmin GP10 Auto Pilot and a great stereo system with 6 JL Audio 7.7 speakers and a new Fusion 750 stereo deck with uni dock and Bluetooth with Fusion 200I upper station remote . This boat also has dive platforms, an 8 ft Power Pole, fresh water wash down, Minn Kota trim tab trolling motor system, Stealth onboard charging system, full interior lighting package and Custom GB tackle center leaning post with slide out Frigid Rigid cooler. For family cruising comfort, this 26 features the new wrap around backrest in the upper station, dodger top with full front deck cushion set, tower enclosure and coaming pads all around. This Gause Built 26 can be purchased with or without a trailer and is ready for your 2015 Keys lobster adventure! This Gause Built 26 has been exclusively serviced and maintained by Gause Built Marine and comes with a warranty on hull and electrical system. For more details and pictures, please give us a call.